Immunolabelling of Mφ by the monocyte/Mφ marker CD14 and the M1 Mφ marker CD80. Mφ were seeded at a density of 5.7×104 cells/cm2, with (coculture) or without the same number of MDA-MB-231 cells. In each case, the culture medium was replaced daily. 5 days later, all cultures were treated with 1 μg/ml LPS and 5 ng/ml IFNγ for 24 h before washing and labelling. CD14 fluorescent labelling is green, CD80 is red. Panel A: without TM, it can be seen that CD80 was expressed on activated Mφ cultured alone and was not detectable on Mφ in the cocultures. Panel B: in presence of TM, no CD80-positive cells were found in any of the cultures. From: Joimel U, Gest C, Soria J, Pritchard LL, Alexandre J, Laurent M, Blot E, Cazin L, Vannier JP, Varin R, Li H, Soria C.
Stimulation of angiogenesis resulting from cooperation between macrophages and MDA-MB-231 breast cancer cells: proposed molecular mechanism and effect of tetrathiomolybdate. BMC Cancer. 2010 Jul 17;10:375. Biotin conjugated Goat anti Mouse IgG (103008) used in conjunction with horseradish peroxidase conjugated streptavidin (710005) for the detection of anti tumor derived antigen IgG by ELISA. Local melanoma tumors generate systemic circulating IgG levels. (A). Outline of local tumor injection experiment. B16.F10-tdTom+ cells were s.c. injected into C57BL/6 mice on day 0 and allowed to proliferate for 30 days. In some mice, B16.F10-tdTom lysate was additionally s.c. injected to test whether IgG production can be boosted. (B) Brightfield (top) and red fluorescent (bottom) stereomicroscopic images of tumor-injected and contralateral footpads on day 30. (C) IgG titers in control and tumor-bearing mice on day 30, with and without additional B16.F10-tdTom+ cell lysate injection for 15 days. Each dot represents the serum of one mouse. Data in (C) are pooled from two independent experiments and were analyzed by a Kruskal–Wallis test with Dunn’s multiple comparison test. **p <0.01, ***p <0.001. Front. Immunol., vol. 6, Mar. 2015. Texas Red® conjugated Goat anti Mouse IgG antibody (103007) used for the detection of bound Mouse anti PSGL-1 antibody on neutrophil differentiated HL-60 cells by immunofluorescence. Recognition of S. pneumoniae by PSGL-1 is a generic event. Co-localization of FAMS-SE-labeled S. pneumoniae clinical isolates of different serotypes with PSGL-1 in HL-60 cells differentiated to neutrophils. 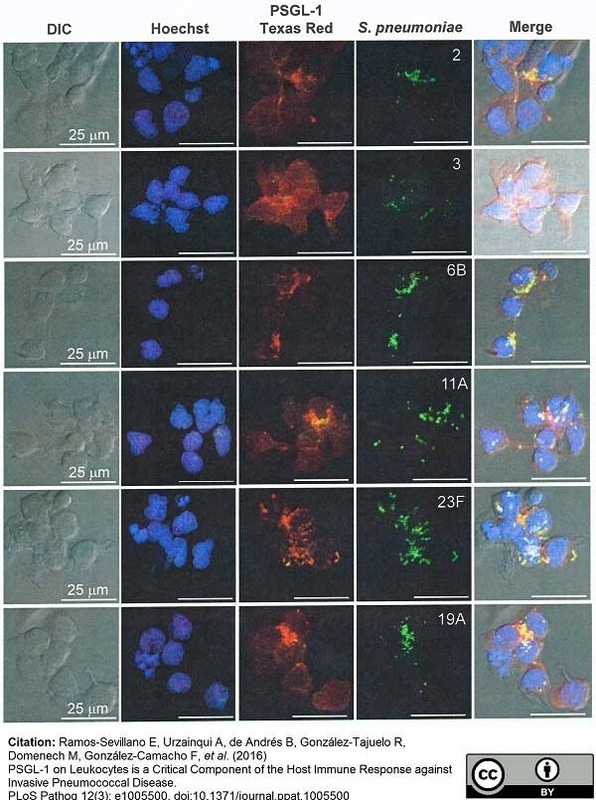 Cellular DNA was stained with Hoechst whereas PSGL-1 was visualized with mouse anti-human PSGL-1 antibody followed by a goat anti-mouse Texas-Red staining. (DIC, Differential interference contrast). PSGL-1 on Leukocytes is a Critical Component of the Host Immune Response against Invasive Pneumococcal Disease. Local co-localization of FAM-SE S. pneumoniae (green), Cellular DNA (blue) and PSGL-1 (red) is shown and quantified by plotting the fluorescence intensity and the distance (in μm). Goat anti Mouse IgG:Alk. Phos. Goat anti Mouse IgG antibody recognizes mouse IgG, recognising the heavy chain of mouse IgG1, IgG2a, IgG2b and IgG3 as demonstrated by ELISA. 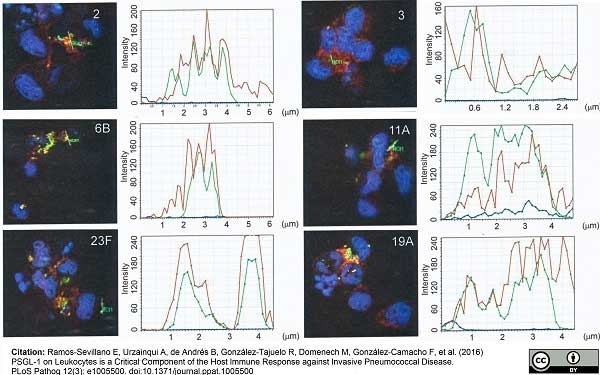 Goat anti Mouse IgG antibody has been cross-adsorbed against mouse IgM, mouse IgA and human serum to reduce potential cross-reactivity. Purified IgG prepared by affinity chromatography on pooled mouse IgG covalently linked to agarose. Texas Red® (TXRD) is a registered trademark on Molecular Probes, Inc.
Joimel, U. et al. (2010) Stimulation of angiogenesis resulting from cooperation between macrophages and MDA-MB-231 breast cancer cells: proposed molecular mechanism and effect of tetrathiomolybdate. Childs K et al. (2012) Paramyxovirus V proteins interact with the RNA Helicase LGP2 to inhibit RIG-I-dependent interferon induction. J Virol. 86 (7): 3411-21. Moalli, F. et al. (2015) Intravital and whole-organ imaging reveals capture of melanoma-derived antigen by lymph node subcapsular macrophages leading to widespread deposition on follicular dendritic cells. Ramos-Sevillano, E. et al. (2016) PSGL-1 on Leukocytes is a Critical Component of the Host Immune Response against Invasive Pneumococcal Disease. PLoS Pathog. 12 (3): e1005500. Abbate, F. et al. (2016) Acid-sensing ion channel immunoreactivities in the cephalic neuromasts of adult zebrafish.